TRUTH MATTERS » Blog Archive » Evidence of Pre-Flood Sacred Writings … Source Material for the Book of Genesis? 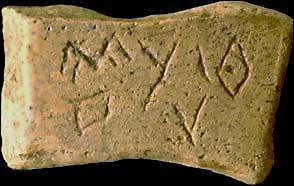 Evidence of Pre-Flood Sacred Writings … Source Material for the Book of Genesis? I have been studying the Book of Genesis for some time now and I am particularly intrigued by the recent rise of “Tablet Theories” of Genesis. My interest came about as a result of the late Henry Morris’ “Defender’s Study Bible” in which he speaks of the Wiseman Hypothesis. The picture above shows a picture of a tablet recently unearthed in Pakistan and dated by the discoverers around 5500 years ago, which is very close to the approximate date of the Great Flood of Noah. Quite a few of these early post-Flood tablets have now been found, but to my knowledge NO pre-Flood tablets have been found. This is not surprising, given the fact that the Flood was global in scope and destroyed everything. Yes, we have found fossils buried during the Flood, but the majority of them have been marine organisms which would have been abundant. Clay tablets would not have been near so abundant and to my knowledge, no pre-Flood human artifacts have been found. Yet there are many traditions not only of the Great Flood, long-lived patriarchs, a Golden Age before the Flood, and many other details paralleling the accounts in Genesis, there are also traditions of Sacred Writings handed down from these patriarchs. It is some of these writings that we postulate were the source material for Moses when he compiled the Pentateuch and added his own material. Many folks have asked me for evidence of these writings, so I present this now. Linked below is a scan from Volume 2 of a fascinating 3 volume set I have by George Stanley Faber, entitled The Origin of Pagan Idolatry (London, 1816). I have referenced him before and his Volume 1 is available in a Google Full View Book HERE. Various forms of “Genesis Tablet Theories” are now coming to the fore and the previously reigning theory, the Documentary Hypothesis, is garnering more and more skepticism. Wikipedia Article on Wiseman Hypothesis which references my blog article. See also Garrett, Duane, Rethinking Genesis: The Sources and Authorship of the First Book of the Pentateuch, Baker Book House, 1991, referenced in my recent Formal Debate on Genesis. Current ongoing debate on The Documentary Hypothesis. This entry was posted on Thursday, September 27th, 2007 at 9:14 am and is filed under Biblical. You can follow any responses to this entry through the RSS 2.0 feed. You can leave a response, or trackback from your own site. There seem to be several ‘leaps in the dark’ here as you use assumption and assertion to conclude that these tablets are post-Flood. Most of the estimates I am aware of for the proposed date of the Flood put it at later than 5000 years ago and therefore it would seem to be the case that these tablets would be pre-Flood. Why do you claim that they must be post-Flood? Is it only because they were found amongst the remains of a civilization that, if the Flood had actually occurred as you hypothesize, all traces of that civilization would have been obliterated? I see also that the report you link to dates the height of the civilization that developed on this site to around 4,600 years ago and indicates that there is an unbroken pattern of settlement there from 5,500 years ago to 3,900 years ago, with no evidence of a global inundation interrupting it. I see as well that the linked report refers to other discoveries that date evidence of writing to 5,300 years ago in Egypt and to 5,100 years ago in Sumeria. As you do not provide a date for the Flood, I have no idea whether or not are you suggesting that these three different writing systems were developed by immediate Flood survivors who had dispersed thousands of miles from the resting site of the Ark? If so, it seems strange indeed (unbelievably unlikely, actually) that they would not have all used the sophisticated writing system that, according to you, was in existence before the Flood rather than developing these somewhat primitive proto-writings. In summary, there seem to be so many unfounded conclusions that you have built on this one piece of archaeological evidence that your article is largely worthless. In parenthesis, I would also rather doubt that Faber provides the most up-to-date source on research into primitive religions. The scan you link to seems to consist largely of speculation and a not unsurprisingly dated understanding of the subjects he covers.